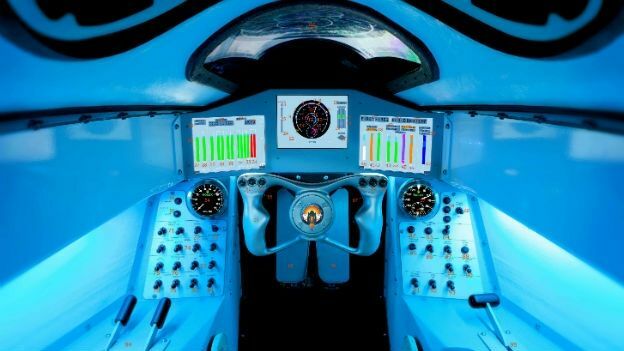 For the first time, the Bloodhound team aiming to break the land speed record have revealed what the interior of the car will look like. And it's suitably impressive. Hand crafted using five different types of carbon fiver weave and two different resins, the monocoque for Andy Green's upcoming record attempts in the South African desert in 2015 and 2016 has taken more than 10,000 hours to design and manufacture. Sandwiched between the layers of carbon fibre are three different thicknesses of aluminium honeycomb core, which provide additional strength. The carbon front section will carry ballistic armour to protect the driver should a stone be thrown up by the front wheels at very high speed. The windscreen is custom-made from acrylic and thicker than a fighter jet's windscreen, sufficient to withstand an impact with a 1kg bird at 900mph. Set at an oblique angle, Andy will be looking through 50mm of curved plastic. Covering a mile in 3.6 seconds, or 150m in the blink of an eye, he will attempt to keep the Bloodhound SSC on course using a 3D printed titanium wheel, specifically shaped to his hands and finger reach. Of the three screens, the central screen shows the speed and Mach number, the left-hand screen shows hydraulic pressures and temperatures in the braking and airbrake systems, while the one on the right provides information about the three engines, including temperatures, pressures and fuel levels. The dash also features two precision-engineered analogue Rolex instruments: a chronograph with built-in stopwatch, and a speedometer. The speedometer is a vital back-up to allow the car to be stopped safely should the digital dashboard fail, while the chronograph will help to time the start-up and cool-down of the jet. The instrument panels have been coated with a special non-reflective grey paint to provide the optimum background colour against which to see the gauges and controls, while the cockpit walls are white to maximise the available light in the cockpit. During a 1000mph run over 2 minutes, Andy will experience an acceleration force of almost 2G and deceleration force of 3G, and so he will be angled back sat in a carbon fibre seat, moulded to his body shape, which will provide unparalleled levels of support and safety. Basically, rather him than us.